If you are anything like us the summer months are your favourite time of the whole year. There seems to be so much more to do to fill your long summer days. From boating, kayaking and surfing to relaxing on the beach and building a sandcastle, summer tugs at all of our heart strings. The hot summer pavement combined with the chilly alpine waters can pose shocks to our systems, especially our feet. This is why it is so important to protect them in the form of water shoes. Getting the best women’s water shoes will ensure that your feet are shielded from the extreme temperatures and of any sharp rocks. Investing in the best water shoes for women doesn’t cost a lot of money but may just be the wisest investment you make all summer. Check out below where we list our top picks for this summer. 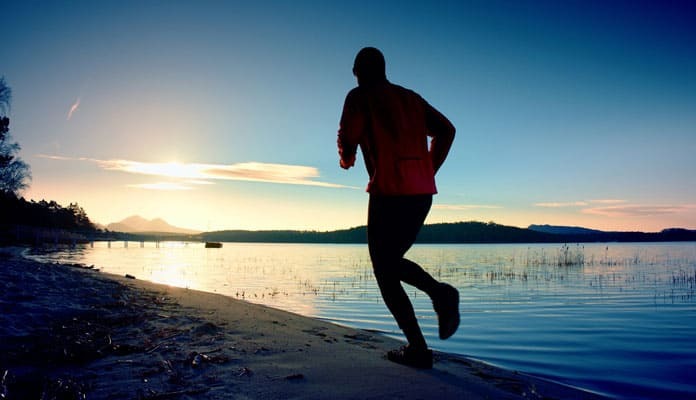 If you haven’t already, click here to see our list of top mens water shoes. A mesh top fabric gives these shoes their quick drying name. Thick mesh holes allow for maximum breathability allowing your shoes to air dry quickly and keep your feet well protected. A ComforDry sockliner is featured in the shoe which increases the shoe’s cushioning and optimizes the shoes environment. As this is removable, it helps to aerate the shoe providing your foot with a cooler and drier environment. Their comfortable design means you do not have to wear socks to weigh you down. The Solyte midsole of the shoe features advanced technology that allows the shoe to perform well without weighing the shoe down. This design makes your shoes have an airy bounce as well as maximizes the shoes durability. The patterned rubber sole offers you a strong yet lightweight grip that will leave you feeling incredibly light on your feet while expertly gripping to the rocks below. If you happen to lose a shoe in the water, rest assured that it will not be lost for long as your shoe will float to the surface. These shoes are great for everyone as their humane design is vegan friendly. It is easy to see the high quality materials and the thoughtfulness that went into designing these water shoes. The design features a smooth mesh top that has an almost seamless build that has only one toe seam that lies flat against the skin. This reduces the chance of your shoe chafing against your skin which will cause irritation and blisters when wet. The mesh fabric is incredibly lightweight in design and is sure to not weigh your foot down in the water. The large mesh pockets allow water to move freely in and out of the shoe allowing your shoes to drain quickly and air dry at a much faster rate. This also allows your foot lots of breathability when wearing these shoes on longer treks on summer days. The Solyte midsole construction of this shoe can be easily seen when looking at the sole. With large holes this shoe is able to provide plenty of cushioning and bounce to your step without the added weight. The ComforDry sockliner found inside the shoe adds additional comfort and cushioning to your foot that creates a much healthier shoe environment. The rubber sole is durable enough to handle longer hikes while keeping your foot comfortable. A secure grip is important in water shoes and these shoes excel in that department. A slip resistant design allows your shoes to grip the surface below you and allows you to easily navigate across slimy rocks and other slippery surfaces. 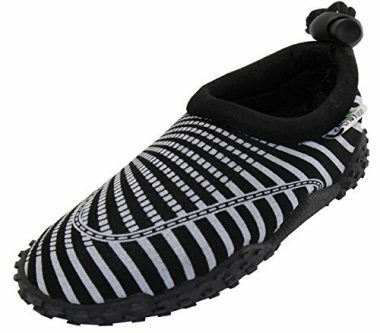 This comes in as one of the top rated female water shoes on the market and it is no surprise why. The Water Grain outsole makes this a superior shoe for water use. Providing a solid traction that grips to rocks even when wet. Available in an abundance of different colors this shoe is sure to show your style while being incredibly comfortable. The mesh top provides excellent breathability while also making the shoe fast-drying when wet. The Solyte midsole keeps this shoe incredibly light making it a great option for travel or backpacking adventures. It also ensures that you stay light on your feet even when the shoe is wet. 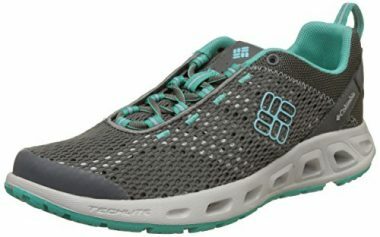 Just read some of these womens water shoes reviews and you will be see how people are raving about this high quality shoe. So much more than just a water shoe, you can use these comfortably on walks, hikes or any beach activity. With an elastic laced top these shoes give you a form fitting feel that perfectly accents your foot shape. They have a snug fit which allows you to swim and snorkel easily with the shoes on adding extra protection while underwater. The outer sole of this shoe has superior watertight grip allowing your feet to stay firmly planted even in slippery conditions. The Solyte midsole design allows these shoes to be incredibly lightweight and also provides the necessary drainage to make these excellent water shoes. A mesh fabric combined with a large spacing design on the bottom of the shoe protects your foot from sand and gravel while allowing the water to drain from your shoe quickly and easily. The mesh design continues to the top of the shoe where you will find superior breathability. This allows the shoes to dry incredibly fast, even when being air dried. The shoe comes with a removable ComforDry sock liner that adds cushioning to the sole of the foot. This also greatly contributes to the hygiene of the shoe as you can remove and wash this liner. The design of these shoes repels dirt and makes them incredibly easy to clean. Simply rinse these shoes off and air dry for a perfect fit every time. These shoes offer great traction on the slipperiest of surfaces. The sticky rubber works great on slippery rocks, even those with seaweed on them. We love the traction, and we also love the support these shoes give your feet. You can wear them all day, and they leave your feet feeling fresh and comfortable. The mid-foot cage provides medial and lateral support to cushion the muscles in your feet. 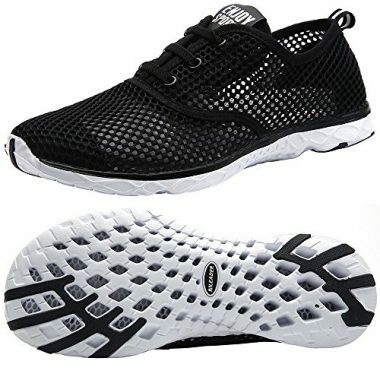 This shoe is great for fitness raining in and around water. They are flexible enough to be used as a running or yoga shoe while remaining tough enough to protect your feet on any surface. 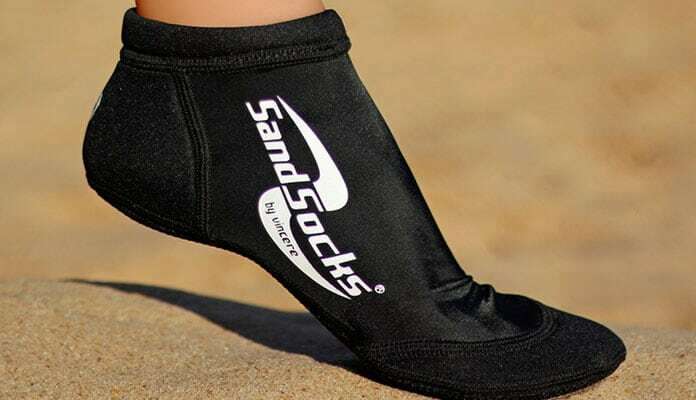 These are perfect shoes for anyone who wants to b active on the beach. They are extremely comfortable, but better than that, they are very accessible for anyone who wants to exercise. They are strong and supportive enough for a short run in the sand, and they provide enough grip and flexibility to be used as yoga shoes. The rubber sole offers great protection while allowing you to move and dance to your own tune. We love the numerous color and design options. These shoes are colorful and unique. When you are wearing these shoes, you will stand out. We recommend that you buy one size up with this water shoe to ensure the correct fit when they are wet. 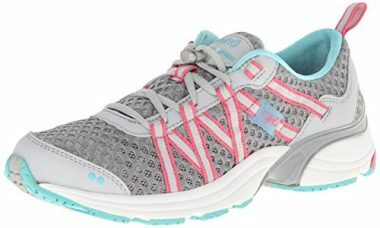 This is another women’s water shoe from a trusted brand. Merrel has a great track record in crafting shoes which are great in a variety of outdoor environments. They are especially suited for rocky terrains, hiking, and lake life. If you are venturing into any of those areas, then these shoes are perfect for you. Of course, they are also perfect for almost any other area. These shoes are slip-resistant, making them perfect for transitioning from wet rocks to mountain rocks. The leather upper is also great for hiking through creeks. These are a well-made pair of shoes which will last you for a very long time. These shoes have been designed to bring you comfort in and out of the water. The shoes as a whole have been designed to fit great on women’s feet. There is also a stretchable heel insert for ease of use, and fit when they are on. The climacool mesh allows the air to circulate through the shoe. This helps to keep your feet cool when you are wearing them and makes them quicker-drying when you are not. The mesh also lets the water out after you have been in the ocean. The sole on this shoe gives you great protection against jagged rocks when you are venturing into new areas, but it also gives you great grip so your feet will not slip when you are on wet rocks. This shoe is from a trusted brand so you know that the shoe is going to last you a long time. This shoe is worth the investment and will last you a long time. If you are looking to combine style with practicality for your next pair of water shoes, look no further. Coming in an array of different colors, these shoes are increasingly popular for women looking to make statements on their next vacation. These shoes are experts at transitioning between the beach and the restaurant. These shoes coat your feet in 360 degrees of mesh material but you wouldn’t know it from a quick glance. 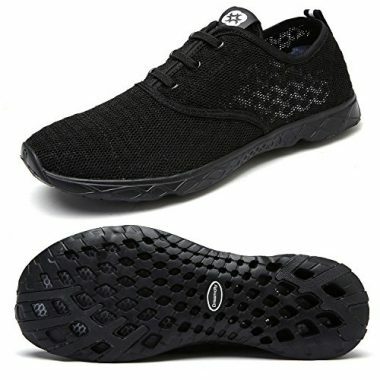 Appearing as regular shoes rather than shoes meant for wet sandy waters, these shoes have small mesh that still provides the feet lots of drainage and breathability. These cool swim shoes for ladies offer a solid toe protection which will allow your foot to sit comfortably even in colder waters. The tight weave of the mesh top allows the shoes to protect you better and greatly increases the life expectancy of your shoe. With a shoe like this, you are far less likely to experience a tear in your shoe. This full coverage shoe offers loads of protection and will stay on your feet with ease. This makes it a great option for faster paced water activities such as water aerobics. The thick elastic phylon sole offers a fully supportive base that will provide stability and protection while walking. They also offer an anti slip base that will cling to the surface and ensure your feet are steady even in wet, slippery conditions. These shoes are made for more than just water and can handle their own on a hike or walk as well. These water shoes are among the fastest drying on the market. There is nothing worse than enjoying a day at the beach, splashing in the water, to find that you cannot get back out there the very next day because your shoes are still wet. These shoes dry in record time to ensure that you spend more time at the beach and less time with the hairdryer. 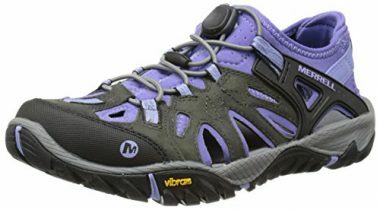 This is also a great shoe for hiking and walking. If you want a combination of a shoe which will be comfortable in the water and also comfortable when you are at the top of a mountain, then you have found it. They also have great arch support, so if you want to go for a short run along the beach, then these shoes will feel comfortable while you do. When choosing your perfect pair of swim shoes for women we recommend looking for the following features. These are the things that will make or break your day at the beach. Having incapable shoes could actually become a danger. 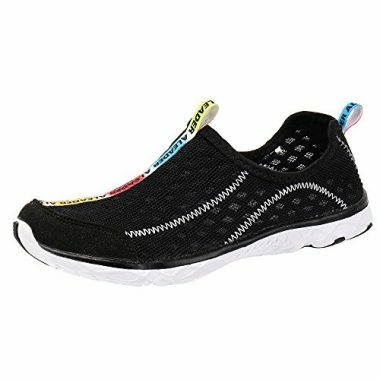 Water shoes are most often made of a mesh material that provides a lot of breathability. This makes them a great option for summertime and allows your shoes to drain adequately. The mesh cover allows water to freely flow in and out of your shoe which makes them not retain water while kicking giving you the freedom to swim and stay in the water even longer even longer. This level of breathability will allow your shoes to be fast drying which means that they will air dry quickly. As these shoes are meant to be used in the water, it is important to ensure that the grip will hold up in wet conditions. The best water shoe will be one that hugs the surface you walk on even when in wet conditions. With that being said, these shoes also need to be able to give you traction out of the water. Walking on the hot sand or rocky terrain should be effortless without slipping or sliding around. 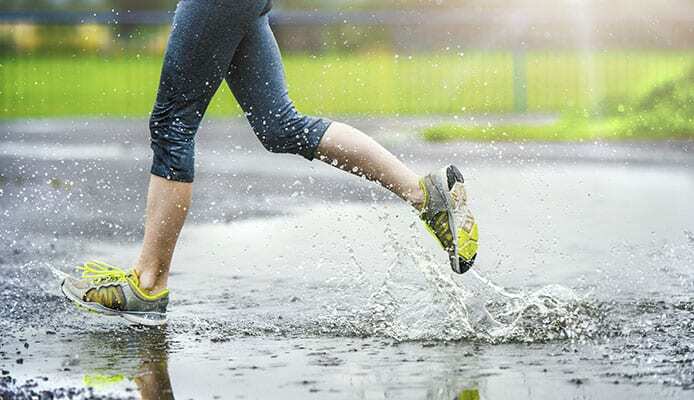 Having water in your shoes will add a lot of weight to your stride and can make walking through water incredibly difficult. Having a lightweight shoe will help to combat this ensuring that you do not feel dragged down while in the water. Most of the water shoes will feel like your feet are naked in the water. Your kicking power won’t be reduced and you won’t feel like you’re being dragged down by anchors on your feet. This is a removable liner that is featured in almost all water shoes. This liner adds comfort to your shoe by adding cushioning to your foot. This is removable to accommodate orthotics or to provide more room in your shoe. It also adds hygiene to your shoe by being breathable. Being able to walk on any terrain as if you were wearing regular shoes will give you the confidence to trek up steep, uneven terrain. Water shoes, like other walking shoes, comes with a thick sole that provides a cushioned layer between your foot and the surface below you. 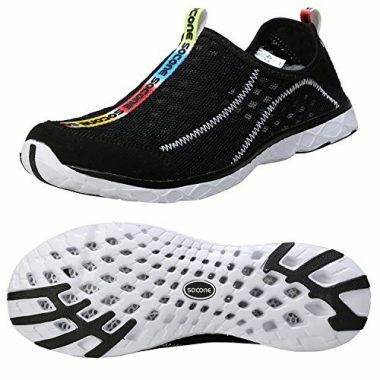 This helps to absorb shock from your step and provide your foot with the comfort that you need. Due to the lightweight design most water shoes come with a removable ComforSock liner. This helps to add additional cushioning to your shoe that is removable to give you a perfect fit. The purpose of your water shoe will determine which water shoe is going to be best for you to purchase. It is obvious that you are going to be using your water shoe in the water, but what else are you going to be using your water shoe for? And, where are you going to be using your water shoe? Not all water shoes are created equally. For example, a water shoe which is perfect for lounging around the pool when on holiday may not be the perfect shoe for hiking up a mountain, but there will be a shoe which will be perfect for hiking up a mountain. When you are deciding on your shoe, you need to know what it will be used for and how that information will translate into the features of your shoe. You should also be thinking about the terrain on which you will be using your shoes. 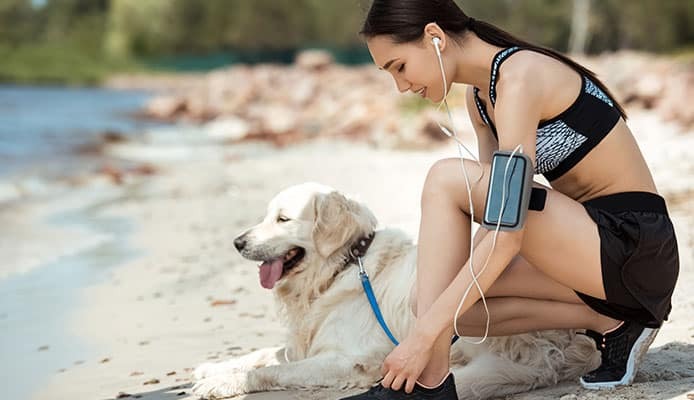 If you are walking along a sandy beach, then most water shoes will be fine, but if you are navigating rocky terrain before you go for a dive, then you will want to invest in a pair of water shoes which have a more durable sole. Decide on where you are going to be using your shoes and on what terrain. Once you have that information, you can begin to think about the type of shoe you need. One thing which we love about water shoes is the flexibility and versatility. Many water shoes do not come with laces, and instead, you slip them onto your feet. Laces are not ideal for shoes which are going to get wet. The laces can become tighter or looser when the water gets into them, which can leave you feeling uncomfortable. Water shoes are also put on and taken off often, especially if you are undertaking a water sport such as snorkeling and you want to swap your shoes for fins. You do not want to have the hassle of tying and untying your laces constantly. Having a slip-on shoe will make your life easier around the water. The other benefit of a slip-on shoe is that you can bend down the heel to turn the shoe into a slipper. This is great if you only need to wear your water shoe briefly, and it saves you time getting it on and off again. You also save on the frustration of broken laces. Laces will wear down over time and snap, but especially so with water shoes. Sand and salt can get into the laces and help to break down quicker. With slip-on shoes, you never need to worry about this. As with any pair of shoes, the comfort of the shoe is very important. It is doubly important with a water shoe as the shoe will be worn when it is dry and when it is wet. This opens up more ways in which the shoe can irritate your foot. If the shoe is not completely comfortable when it is dry, then there is a good chance that the shoe is going to irritate you when it is wet. You should seek out shoes which fit you perfectly so that they do not irritate you when you are in and out of the water. The comfort of your shoes also has something to do with the purpose of the shoes. 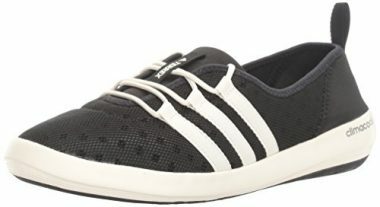 If you are going to be lazing by the pool when you are wearing your shoes, then a pair which feels comfortable on your foot is going to be fine, but if you are wanting to hike up a mountain with your water shoes on, then you are going to want to invest in something with good arch support and a durable sole. 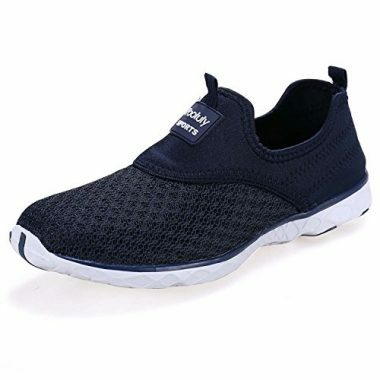 Casual shoes can be fine with any type of sole, but if you are going to be doing a lot of walking, then you are going to need something with a gel or foam insert to leave your feet feeling comfortable at the end of a long day. Drainage holes are very important for water shoes (even if you do not have drainage holes, you may have some other way to allow the water out, such as mesh material). When you are in and around the water, it is inevitable that you are going to get water in your shoes. If this water has nowhere to go, then it is going to sit on your feet and feel uncomfortable as you squelch around with the water in your shoe. It is also going to make uncomfortable noises. On top of that, the water is going to damage your feet. Your feet are going to wrinkle and dry out with the salt in the water. Look for a way for the water to drain from your shoes. There should be holes on the bottom or the sides of your shoes. We recommend looking for shoes with holes on the sides at the bottom rather than on the bottom. Holes on the bottom will let the water out, but it could also let debris and particles in. Sand and dirt can get in through the bottom, depending on the sizes of holes in your shoes. Holes in the bottom of your shoes also means that your feet are less protected than the soles of the shoes were solid. A better material means a better shoe. We always recommend spending a little more money on a shoe which will last you. Cheaper shoes will come with cheaper materials which can break down quicker. Look for material which will hold up to salt water, and also material which is durable and flexible. A: Water shoes are basically shoes which can be worn in the water. The main difference between water shoes and regular shoes is that water shoes will withstand water better and often feature a harder sole to allow for navigation over rocky terrain or other hard and jagged surfaces. They also differ from flip flops in that they protect the entire foot as opposed to just the bottom of them. They offer a good compromise between regular shoes and fit flops. You will also find that water shoes feature drainage holes to allow the water to drain as it gets inside your shoe. They are great for walking along the beach, lazing by the pool, and hiking over rocks. You can also use them in water sports, such as surfing, as they are fine for submerging in the water. Q: Are Water Shoes Necessary? A: No, they are not necessary. If your feet can stand walking over jagged rocks, then you do not need to wear them. You could avoid rocks altogether. You coral also avoid water altogether. Water shoes are not necessary, but they do make your life a lot easier when you are in and around the water. They protect the soles of your feet from jagged rocks, shells, and sea life. They also give a good transition from dry land to the water. You do not need to take your shoes off to get in the water if you are wearing water shoes. We love them for walking along a beach and then going for a swim. Sometimes the ocean floor can be rocky or covered in seaweed. Both can feel unpleasant on your feet as you walk out into the water. A good water shoe will protect your feet from that discomfort. Q: Are Water Shoes Water-Resistant? A: Water shoes are not water resistant. They are not designed to repel the water or keep it off your feet. Instead, they are designed for comfort and protection. They are designed to keep any sharp objects from penetrating your sole while giving impact-resistance to the remainder of your foot. They do feature drainage holes to drain the water away, but they are not designed to keep water off if your feet. They function in the same way as a regular shoe does, but the difference is that they will not break down quickly with the water exposure, and they will remain comfortable when they are wet. Q: How Should Water Shoes Fit? A: A water shoe will fit differently to a regular shoe as they do not usually have shoelaces to tighten the shoe when it is on your foot. When you are sizing your water shoe, you should bear in mind that water shoes will shrink slightly when they are exposed to water. For this reason, we recommend buying a water shoe which is half a size larger (or a size larger if you cannot find half a size larger). When you wear your shoe dry, you will not notice that to is a little bigger, but when it does shrink down a little in the water, you will be thankful that you do not have a shoe which is constrictive. A slightly bigger size will also give more room to wear a water sock underneath. Q: How To Clean A water Shoe? A: Cleaning a water shoe is an easy thing to do. We recommend washing your water shoes after they have been in contact with any salt water. You do not want the salt to build up and be left in contact with your shoe, or you risk the shoe wearing out quicker. We find it best to submerge your shoes in some warm water for a couple of minutes. This will help to loosen any particles and will dissolve the salt. Once they have soaked, you should rinse the shoes off with warm water. This will remove the sand and salt on the shoes. Makes sure to rinse the outside and the inside. If you find that your shoes are dirty or discolored, then we would recommend washing them with warm soapy water and a sponge. You can also use baking soda to remove any stubborn stains. Once you have washed them, rinse the soapy water from the shoes. You should leave your shoes to dry, but keep them out of direct sunlight to avoid any damage from UV rays. You could also use a hairdryer to dry them if you need to wear them again before they are going to be dry. If there is any smell to them, then sprinkle some baking soda inside of team when they are in storage. When looking for a summertime shoe, we recommend opting for a shoe that can be used both on land and in the water. A good pair of water shoes can prove invaluable during the summertime whether you are paddleboarding, snorkeling or simply enjoying a day at the beach. A perfect shoe combines a blend of cushion, weight and breathability. The material should be tough enough to withstand rough coral and rocks while giving your feet enough air to breath without sweating. Did your water shoes make our cut? If so, tell us how they work for you in the comment section below.